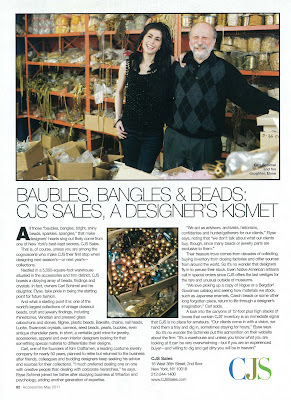 Vintage closeout bead, craft and jewelry part supplies: rhinestones, pressed glass cabochons and stones, findings, filigree, wood, plastic beads/parts, bakelite chips, chain, nailheads, lucite, Swarovski, cameos, seed beads (even 17^0’s), Venetian one hole beads/cabs, chandelier parts, etc. We specialize in liquidating vintage items/components (we also have some finished vintage costume jewelry/accessories from the 60's-early 90's). It is a warehouse and unless you know what you are looking at it can be very overwhelming - but if you are an experienced buyer and willing to dig/get dirty you will be in heaven! Wholesale only (no retail customers).